Feeding Solids on a Babywise Schedule. How to set up your baby’s feeding schedule. What your daily schedule should be for feeding solid foods. Many moms start baby on solids while baby is still eating six times a day. Others are at 5 or 4 and wonder when to do the solids. Here is what our schedule has looked like (after all foods were introduced). 9:30–Dreamfeed (feeding the baby but you don’t work to wake them and you put them right back down immediately). At this point you are on a 4 hour schedule and meals start to line up with the family mealtimes. 6:30-7:00–Wake up*, Nurse, Solids (Veggie, fruit, and cereal) *your baby may or may not be taking a nap between these two feedings, mine did for a while but that is the next napped dropped. I am sure you noticed that I don’t feed solids at 3:30 like the book says. I do this for two reasons. One is that it is more convenient for me because we often run errands after that nursing (and on those days she doesn’t nap) and it is easier to get away quickly when we don’t have solids to deal with. If I am not running errands, I am busy fixing dinner. Two is that I just feel better stuffing her full before a long night of no food. I did this with both kids. This is just what I did. Take my ideas and run with it. Do what works for you. Let your schedule serve you. McKenna has a later schedule in the day. For some reason, my mind cannot feed solids at 3:30 PM, but 4:30 is okay 🙂 Also, since her last feeding is so late in the day, I don’t want to add solids to the mix. I want bedtime to come as early as possible! Do you suggest doing solids at bedtime for my 6 month old? That is your call. I fed both of mine solids at the feeding right before bed. Some people find doing that makes their child’s blood sugar spike and not sleep well. I think most that do it find no problems, though. My 6 month daughter usually eats 1/4 cup of rice cereal in the morning. This morning she only had a couple of bites. Should I offer rice cereal at her next feeding or just have it a missed solid meal?Also I was looking at your solid schedule and had a question. Before she’s on green vegetables can I do rice cereal in morning, carrots and sweet potatoes for lunch, then rice cereal and squash for dinner or should I just do one veggie at lunch?Thanks! Emily, I would not offer rice at the next meal if she usually does not eat it. You can do more than one yellow veggie at lunch if you want/need to. Some babies like more variety in their diet (like my kaitlyn). Some will happily just eat more of one food, though (like my Brayden). Just be sure she has been introduced to each veggie one at a time. I was reviewing your sample schedules (specifically for 6 months), can you explain why you gave solids at the last feeding (7pm) instead of at dinnertime (5pm)?I am having an issue with my son at bedtime, he needs to stay up after eating b/c of acid reflux. We usually feed him at 530 (nurse + solids), then again at 730, but put down to bed at 8:15. He is started to really cry again, I think he may be overtired. do you suggest having the last feeding a little earlier or switching the solids to the last feeding so it will help keep the liquid down? thanks so much. Reds, There are a couple of reasons. One is that with Brayden, he really needed that meal to be later to make it through the night. He has a really fast metabolism. I think Kaitlyn could have done it earlier and still slept fine, but we often left to do errands after the feed around 4:30ish (I can’t remember off the top of my head what time that was at that age). To feed Kaitlyn solids took FOREVER at first, so it was easier for us to leave quickly if she ate later.You might try one or the other or both and see what works. I can’t see one or the other being any better. Previous Post Solids: When Will a Baby Master Eating From the Spoon? Next Post Solids: What do they eat at each meal? My question is how much of each? I’m going to start solids this week w/ organic rice cereal. So, how much cereal, and how much in the bottle? Right now he is getting 6-7 oz. a bottle. Do I keep the same amount in the bottle, and am just adding the cereal? I understand the schedule, but am just confused about how much he shuold get of formula, cereal, fruit and veggies at each feeding. Thank you! Here are some posts that will answer your questions:Solids: How Much Food Will Baby Eat? : http://babywisemom.blogspot.com/2007/12/solids-how-much-food-will-baby-eat.htmlSolids: How to Start? : http://babywisemom.blogspot.com/2007/12/solids-how-to-start.html Solids: What do they eat at each meal? : http://babywisemom.blogspot.com/2007/12/solids-what-do-they-eat-at-each-meal.htmlHave fun! I should clarify my above post (ejhicks); The reason solids takes so long is that Taylor will only take a few bites and then start pursing her lips and daydreaming or ignoring me. Clearly a sign that she’s not interested. But if I change to a food I know she likes (pears, yogurt, sweet potato) she’s eager to take quite a few more bites. I have to shove the first bite in so she’ll realize its a different food though. Am I being too patient? Or just teaching her that if she holds out, I’ll eventually give her the “good stuff”?? Should I just stop after the first two bites? Just to complicate matters the past week she has become very uninterested in nursing at times. Maybe she’s starting to wean? teethe? Maybe she needs a four hour schedule? Needless to say she’s not taking in very much at all so hence I really persevere on the solids. I should add she’s only 6.5 months. I really appreciate any opinions you have – Thanks! I too am curious about how long to nurse before giving LO solids each feeding. Right now I am nursing about 15 minutes (1/2 of “normal”) and then giving solids. She ate 3T today and I think she would’ve eaten more, but I was concerned about overfeeding.Thanks for any help you have! Erin,I nursed one side, fed solids, nursed the other side. It is a REALLY long process at first. It is kind of annoying really. Your baby is down to nursing in about 10-20 minutes total, then you add solids and it suddenly becomes a 40-60 minute ordeal. That is what I did, but I know there is currently some controversy about it because some say you should not cut down on breastmilk at all. Doing it the way I did it will cut back on some breastmilk. I just wouldn’t do nurse, one hour, solids. Then you start up snacking. If you don’t want to cut back on breastmilk, I would just nurse then try solids. If she doesn’t eat them, she doesn’t eat them.When it comes to foods she doesn’t like, I would just keep giving it to her and giving it to her first. I linked a couple of post for you on the other post question you had. So follow those guidelines.I don’t know that she would be self-weaning. She might be teething. She also might be ready for a longer time interval between feedings. Be sure you haven’t changed your diet at all. Good luck figuring it all out! Christy,As I said above, I would nurse then feed solids. Then finish up the nursing. If your baby is a good solids eater, I think it is wise to slowly introduce the amount and feel out how much she needs. Once she is completely happy with solids and comfortable with it, you can nurse both sides or full time before you do solids and just let her eat until she is full. That is ultimately for you to decide. I do dinner at the later feeding, but BW says to do it at the earlier one. I would choos whichever is more convenient for you. It takes tme to feed solids (sometimes a lot). 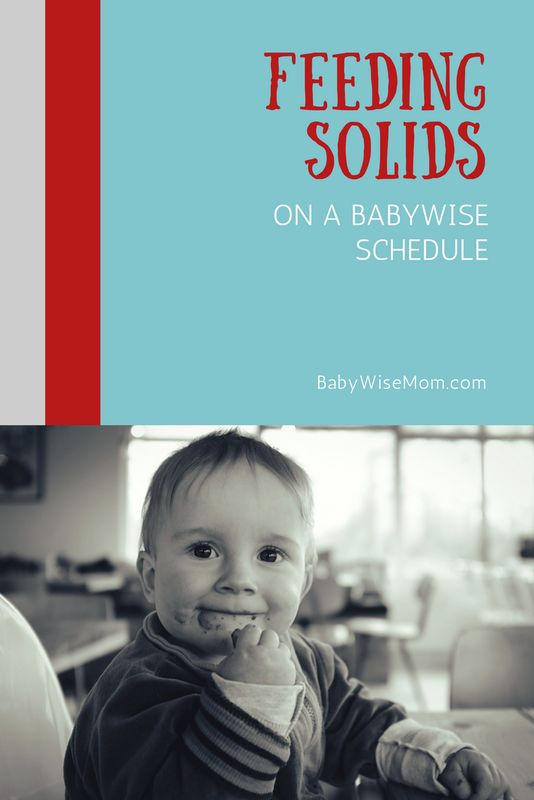 We would often run errands after the 4:30 ish feeding, so to add the time of solids to the mix was not convenient. So we did the later feeding instead. Either way, you will be be able to adjust to your regular dinner time when the time comes. I have a few questions about formula and solids. Do you always give a bottle(or nurse) when giving solids? At what point do you stop giving the bottle and just give solids? At what point do you stop the 4th liquid feeding? Thanks! My 9.5 month old is on a 4hr schedule. This is what we had been doing:8:00 nurse, oatmeal, fruit12:00 nurse, lunch (size 3 veggie, fruit)4:00 nurse7:307:45 nurse, dinnerMy problem is she gets too hungry b/w the 4 and 7:30 feeding since her last time eating solids was at 12. I’ve given her finger foods to snack on but it’s not enough for her. Can I feed her dinner earlier inbetween 4-7:30 feeding, instead of at 7:30, and then just nurse her at 7:30? I also want to be sure she has enough food to last through the night too though. Will nursing my son before feeding him solids make him full and not want the solids? I am just in the research stage with a 4 month old. Thanks so much! Brave China Doll,It is possible. That is the reason that I start off nursing one side, feeding solids, then nursing the other. Once the child is a good solid eater, then I go to nursing before. Some find they need to nurse after solids, but do keep in mind that at this age, the breastmilk is still the most important part of your baby’s meal, so eating more breastmilk and fewer solids is not bad. Hi..my son is almost 4 months old and I'm going to give him cereal by that time.I'm still confused here between feeding bottle + solids at the same time or give 2 hour difference before giving solids (e.g. 7.30am bottle, 9am cereal)?If giving it at the same time, should I reduce the amount of his milk? Hi Plowmanators, I see that that on your schedule above you mention that you nurse, followed by solids and then bed. I currently do solids, followed by bath, followed by BF and directly to bed. Is this a problem that I BF right before bed time, will I regret it at some stage? (she falls asleep independently). Thanks for your blog – it is a precious service to all us mommies, you are a life saver. Thanks for posting this, I was wondering if what I was doing with my son was the best option. I am doing something similar to what you did. 700 wakes, bottle, solids1100 wakes, bottle, solids300 wakes, bottle5-530 small bottle, solids730-8 bottleThat way he eats dinner right before we do & I give him finger foods while we eat & sometimes at 300. What do you think? SAmom, it shouldn't be a problem so long as she falls asleep on her own and she isn't nursed right before naps. My almost 6 month old is just starting cereal / solids this week and I'm trying to move from a 6 feeding schedule to the 5 feeding schedule. I am wondering what time you were putting the baby to bed with this schedule. I had been putting her to bed at 9pm just after feeding and waking up at 7am. We're having some trouble transitioning. Thank You. Bridal Blogger,Since you can't feed him any more, you will want to feed him more often. So you would want to go back to every three hours. Good luck! I have a 5 1/2 month old girl. I am a working mom and she goes to a in-home daycare. They are pretty good about keeping her on a schedule. I introduced her to solids a couple of weeks ago and this is our schedule. 6:45am- wake, change, bottle8-8:15 – Solids (wait until she gets to daycare)11am – wake, bottle, solids3:00pm – wake and bottle5:00 – pick up from daycare6:15 – solids, then bath, bottle 7:30 – bedSometimes she can't go the 4 hrs and sometimes she can. She also is a little fussy in the evenings after I pick her up. I am not sure if this is the right schedule for her, if I should add back another bottle?? Any ideas for a working mom?!?! Sorry…After the 3 pm feeding? Or is it random which feeding?If it is consistent, I would plan on doing that interval closer. If it is random, she might be better with a 3.5 hour schedule and maybe 1-2 four hour intervals. I would guess she is fussy in the evening partially because she probably doesn't sleep as well at daycare as at home. Another reason is babies just get grumpy in the evenings. I would go back to five feedings a day and see of that fixes it. Hi Valerie, my daughters schedule has followed the same times as your childrens for six feedings, five feedings, and four feedings. Im currently trying to implement four feedings (formula fed & solids) and having a difficult time moving naps from 3 to 2. Currently, her nap times are 9, 12, and 3. Now she has started to sleep 9-11 for the first nap, based on the four feeding schedule you have listed, when do you advise her 2nd nap to be? Thank you kindly! Hard to say for sure without her age. Usually if you are on four feedings, you are feeding every four hours. That usually means up for two hours, down for two. So the second nap would start around 1 pm. Hello! Love reading your blog, your responses are so very helpful! I've read through 3 of your blog posts about starting solids and I don't believe I found the answers yet to two basic questions:1. Why do most people seem to feed their babies the bottle/breastmilk first, before solids? I just started rice cereal a few days ago and we've been doing the bottle after the cereal. I was afraid that if I did it before, then he wouldn't want the cereal because he'd be full or would get frustrated (since the whole task of eating is a new skill for him).2. When Babywise says to add 3-4 TB of water or formula to rice cereal, should I take the formula from his bottle for that feeding (thus less volume to intake from the bottle) or make up formula separately for that purpose? Thank you!